When you are having a stressful day, it might be tempting to call for takeout (we have all been there! ), but making a healthful meal – that can calm your nerves too – can be as simple as turning on your blender! 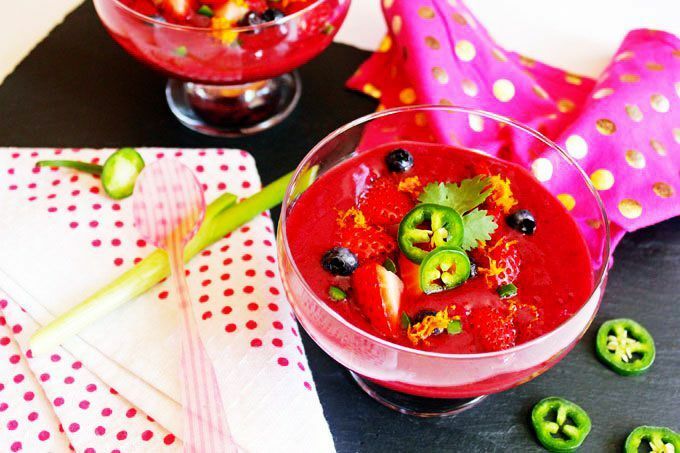 This spicy berry gazpacho contains strawberries, raspberries, blueberries, and fresh orange juice; all of which are high in vitamin C. Vitamin C has been shown to reduce blood pressure and tension overall. The soup gets a kick from chopped jalapeño peppers, which believe it or not, can also help you to de-stress as eating spicy foods increases production of the feel-good hormone serotonin. You can eat this gazpacho straight out of the blender, or chill it for a refreshingly cool twist. Either way, it will be ready in a matter of minutes, and be better for your body – and your mood – than most anything you can order in! In a blender or food processor, combine ½ cup of the strawberries, ½ cup of the raspberries (or blackberries), blueberries, pepper, maple syrup, orange zest and juice, and water. Blend until smooth. Add more water if you prefer a thinner consistency. When serving, spoon the blended mixture into a bowl, and top with a small handful of the remaining berries and a sprinkle of green onion. What are your favorite quick recipes?